I bought this phone 4 months back and I&apos;m satisfied with the overall value for money package. It&apos;s the smoothest Android experience you can get under 15k in India. I got it at 12k from amazon while sale. overall its best as per price. Totally satisfied. Bought this phone after Pricebaba recommended it.I had very specific requirements like good camera and 32GB internal memory. The camera has not disappointed me and neither has the overall performance. What I like the most is the turbo charger! Battery lasts long enough for me considering the wifi is always on along with many apps. Did not notice the lag in the performance till now. The Moto G series has been quite fantastic. I first bought the original Moto G on the release date and did the same for Moto G4 Plus. I have been very pleased with the phone as it offers great features for that price and doesn&apos;t have any performance or stability issues that a budget phone shouldn&apos;t have. It has lived upto my expectations and the negative points are minor and none of them are showstoppers for me. Only thing that bothers me is inability to use the phone while charging as there are ghost touches. But, with fast charging, one doesn&apos;t have to wait too long. Lack of compass is a problem. When new it&apos;s a good phone and seems like a great value for money which it actually is, but it has now started lagging a lot, and the outer lens of the camera is too big that now it&apos;s totally scratched up, one of my friends phone got the power button out, I mean it got out of the phone... Which is mostly irreparable at the service center.. some others also faced a variety of problems. Not the same. Which means the production is not so good. Amazing phone to buy from Moto.loved it seriously. Bought this phone around 3months back and now I can say I am fully satisfied with it. Best Android phone in this price range. 93 Pricebaba users have written their experience with Motorola Moto G4 Plus 32GB. If you own Motorola Moto G4 Plus 32GB, please do leave your feedback too. Lowest price of Motorola Moto G4 Plus 32GB price in India starts at Rs. 8,999 Motorola Moto G4 Plus 32GB is available on Amazon at Rs. 8,999. Prices updated on 26th April 2019. The Motorola Moto G4 and G4 Plus, both come with the same 5.5 inch Full HD LCD displays. This is the first time that we have seen a Full HD display on Moto G devices. It gives the phone a PPI of 401. The display also features Corning's Gorilla Glass 3, which acts as a shield to your smartphone. Powering the device is an Octa-core Snapdragon 617 chipset. On the camera front, you have a 16MP rear camera and a 5MP shooter on the front. By all accounts, this is the best camera on the Moto G series so far. Another first for the Moto G series in the case of the Moto G4 Plus is that it comes with a fingerprint scanner on the front. The phone weighs 155 grams and does away with the curved back design for a more flat shape, even though the Motorola dimple is still present and prominent. On the connectivity front, you have 4G LTE (with VoLTE), Wi-Fi, Bluetooth and the other usual suspects including support for dual SIM cards. The Motorola Moto G4 Plus is available in two memory variants. You get a 2GB RAM version with 16GB internal memory as well as a 3GB RAM variant with 32GB internal storage. There is support for a MicroSD card, so you should have little problem in storing all your media files. The battery on the device is a non-removable 3000 mAh Li-ion unit, which should last a full working day. The phone also supports Motorola's Turbo Charging and the box contains a Turbo charger as well. The device comes with Android Marshmallow 6.0.1 out of the box. 1. 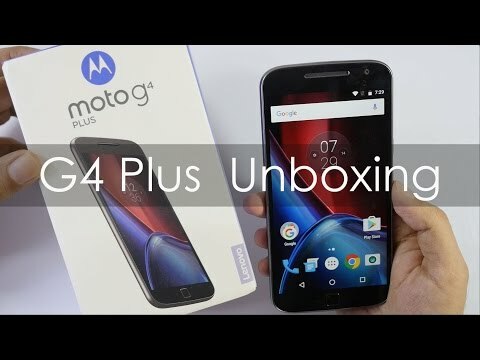 Does Motorola Moto G4 Plus work with Reliance Jio Network? Ans: Yes, since this phone is compatible with VoLTE (Voice over Long-Term Evolution), it works with Reliance Jio Network. 2. Does this phone support OTG? Ans: Yes, this phone comes with USB OTG (On-The-Go) support. Ans: There is a removable back cover. However, since the battery is bolted in, you cannot remove it on your own. 4. Is Motorola Moto G4 Plus waterproof? Ans: No, Motorola Moto G4 Plus has no IP (Ingress Protection) certification for dust or water resistance. 5. Does this phone support 4K video recording? Ans: No, it supports up to 1080p Full HD (High Definition) video recording at 30fps (Frames Per Second). 6. Does this phone feature a Hybrid SIM slot? Ans: No, it comes with two SIM slots as well as a dedicated microSD card slot. Ans: Moto G4 Plus houses a 16MP rear snapper with dual-LED flash. It is among the best cameras in the given price range.